there she is, hanging, shining, beaming, i tell you. illuminating, casting shadow. not a reticent bone in her body. she is out there. boldly. no peek-a-boo moon this one. she’s there now, just sliding down from the nightsky, our nightsky at least. she’s moving on to someone else’s night now. i’m left standing here, jaw-dropped, marveling. moon struck. the moon, when you watch her, puts on one heckuva show. problem is, we don’t watch her so much anymore. we’re busy. we’re tucked in our houses, under our 100-watt moons. we might be out driving, but it’s the fluorescent beam that keeps us on our side of the yellow line. who, since the owl and the pussycat, thought to steer by the light of the moon? when’s the last time anyone turned out the lights and watched how the moon shines? a coupla kooks for the moon show, my man-child and i, we headed out to the horizon’s-edge theatre the other evening. took our seats right there on the beach. waited. the opening act, clouds billowing, streaked with azalea and rich dabs of peach blossom, they warmed us up, got us ready for what was billed as the 5:39 showing of the full worm moon rising, only eclipsed. a once-every-few-years total eclipse, which means that, by the celestial geometry that dictates these things, ol’ mama earth had wedged herself wholly between moon and the sun, and all that we’d see of the moon was the shadow of earth cast on moon’s face. well, don’t you know, those opening clouds did not get off the stage. they stayed there and blocked the big act. so we sat, and we waited, kept thinking she’d get up, take a bow. but nope, clocks all over the beach (for we weren’t the only ones who’d been drawn to the moon show) ticked toward 5:45 and then, finally, 6. there would be no moon show, not yet anyway. by the time we drove home, by the time we were nestled back snug in our house, that ol’ wily moon, she appeared. broke through those show-stealing clouds. shone bright as a beacon all through the night, and me and the man-child we kept gawking. there is, for my money, nothing quite like the nightly moon show. especially the once-every-29.5-days moon show, the full moon show. the one where her whole face is aglow, all lit up, like, well, the moon. got me to thinking how for so many eons, and in so many civilizations, the moon was the beginning and end–save, maybe, for the sun (which, to my taste, is a tad boring, same old, same old, day after day). but for us, most nights, the moon, it’s barely a blip. if you check the old farmer’s almanac, a compendium of charm and delight if ever there was one, you would find that each full moon has a name. 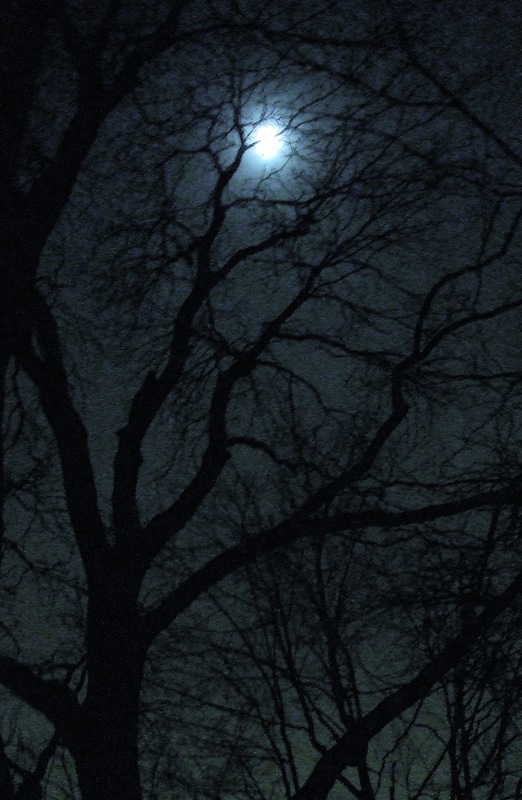 the one shining right now is, by some accounts, the worm moon, because for the native americans who named her this was when the rains came, and with the rains, came, you guessed it, the worms. thus, the full worm moon. in colonial america, she was the fish moon. the chinese call her the sleepy moon. to the cherokee, she’s the windy moon. the choctaw, sadly, called her the big famine moon. the dakotah sioux, poetic, pragmatic, call her “moon when eyes are sore from bright snow.” the celts, snaring their own bit of poetry, call her moon of winds. and the english medievals, primly, call her chaste moon. hmmm. once upon a moon, wise people looked into the nightsky for, well, wisdom. for when to plant, and when to set sail for new lands. for when to wage war, and when to harvest their fields. the moon, you remember, has the power to pull oceans in and out like a yo-yo. and somehow it has something to do with the number of kooks who come barreling into emergency rooms and jails and other dark corners of the moon-lit city. remember the term, lunatics. hmmm. as for the moon shining light on the farmers, how’s this: whole fields were laid out according to the phase of the moon. from new moon to full moon, when each night a new sliver of moon is lit up, you planted your crops that bore fruit above ground, foods that delight in the light. but from full moon to the next new moon, when every night one less crescent is lit, you planted your under-ground foods, the ones that produce in the dark. your radishes, carrots, potatoes, and such. by the way, you would never plant on a full or a new moon. and no seeds should be scattered on earth during the 48 hours before the full moon, the book says so. perhaps that has something to do with the universe stingily gathering all life-force for the full glow of the moon. as for those sea captains, they charted the pull of the moon on the tides, decided when to pull in and out of the ports, depending how high or how low the waters, which of course might have meant the difference between scraping the bottom–or not. it’s spine-chilling to think that as long as there have been bipeds walking this earth, there has been an undeniable pull between mere earthlings and moon. once it was the night’s only bright light. but then, as torch passed to torch, and lightbulb turned on, and now as you fly up above, whole beltways of light light this globe, we seem to care less and less about dear mama moon. ancient peoples once thought her a big bowl of fire; then, a mirror reflecting the light of the earth. the greeks, smart, figured out she was a sphere orbiting. plutarch, though, thought little people lived on the moon. ptolemy thought moon and sun revolved around earth. copernicus, though, straightened him out. galileo mapped the moon in 1609. neil armstrong slapped his 13-by-6-inch left foot on her moondust, july 20, 1969.
all the while, she’s hung in there, the unflappable light of our night. the bright beam of all of our dreams. undaunted. sad fact is, she’s slipping away from us, one-and-a-half inches a year. i don’t know about you, but i’m thinking we turn out more lights, we look to the moon. we bow down and honor the moonbeams. she’s been keeping us out of the dark for as long as there’s been creation. and that, friends, is worth more than some awe as we stand under the nightsky and whisper our moon incantations. p.s. for a peek at the mighty fine cloud show, the one that got in the way of the worm moon rising, check out the lazy susan, which, as always, was restocked over the weekend. p.s.s. dear marlee we’re thinking of you…..
thanks for making me think about the often-missed beauty of the moon. beautiful! We too tried to view the lunar eclipse here in NJ and we were clouded out. Beautiful pictures as usual. It is so nice to know the same moon shines over us all. Wonderful photo at the lazy susan as well–taken while you waited. I feel like I expose my moon-worshipping side around here fairly frequently. I go, well, loony over the moonrise right out of the lake, when it looks huge and orange, like a pumpkin. We too missed the eclipse this time. Perhaps next time. I’ll be paying attention, and so will you folks, despite all our light bulbs.